Today we are sharing with you two interesting Google Docs templates that students can use to create fake Facebook pages for a famous literary character or historical figure. This is a good and fun way to engage students in research practice. These templates, created by Derrick Waddell, are available in the template gallery of Google Docs where you can download and use them on your own Drive. The Fake Facebook templates provided here are created using Google Drawing meaning that when you click on “use this template” button associated with each of them, a copy of the document will be opened in your Drawing. From there you can customize them the way you want. There are instructions and suggested ideas to help students use each of these templates. 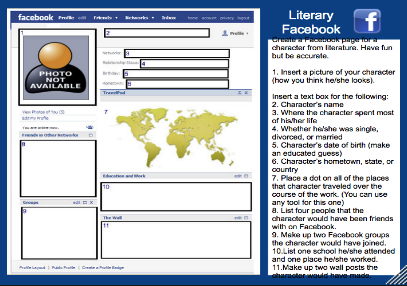 Students can use this template to create Facebook-like pages on famous literary characters. This one can be used to design a Facebook page for a popular historical figure.